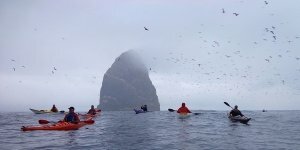 Our Outer Hebrides Expedition is an exceptional experience and world class destination for those with some kayaking experience. 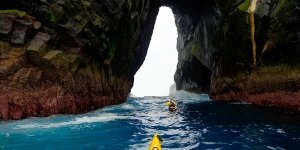 Non-paddlers are also welcome if a partner or friend wishes to join the trip. 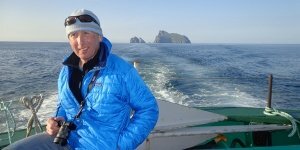 New for 2019 we head for the Southern Outer Hebrides. 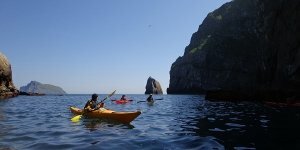 This is a kayaking expedition with a difference – we live on board the Seahorse II, a small cruise ship with first class accommodation and dining, that can anchor in remote and beautiful places giving us the opportunity and flexibility to paddle at some breathtaking locations. 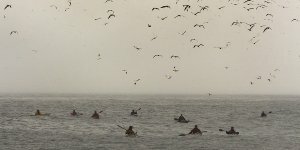 We aim to paddle at Barra, Vatersay and then further south at the uninhabited islands of Sandray, Pabbay and Mingulay. These islands are stunningly beautiful and spectacularly diverse in their scenery which ranges from exposed and dramatic cliffs to sheltered sandy beaches with turquoise blue seas. 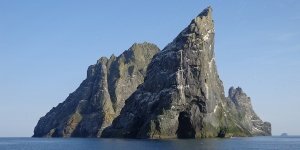 Mingulay will be our priority, and in all respects, a nearer St Kilda due to it having some of the most fantastic cliff scenery in the UK, its isolated location and exposure to the weather and ocean. Out on the water you will be looked after by two instructors qualified to coach and lead in advanced conditions on the sea. On board the Seahorse II your professional skipper who is passionate about boats, sailing and the natural environment of the islands, will be happy to share his knowledge of the area. You’ll have your own on board chef, who provides wonderful meals, locally sourced and freshly prepared from the galley, and a bosun/crew member who will be there to provide assistance whenever you need it. Accommodation is provided in twin and single temperature controlled cabins. All have washbasins and two are ensuite. All cabin linen, towels and bathrobes are provided. The Seahorse has a spacious deck saloon, as well as a very accessible aft deck which gives us the option of dining alfresco as well as plenty of space to store our sea kayaks with easy access onto the water. If you want to bring other outdoor or water sports gear, please do, there’s plenty of space.